Standing tall at 2329 m, Mount Bromo is one of the most iconic mountain in Indonesia nad one of the most active volcanoes in the world. 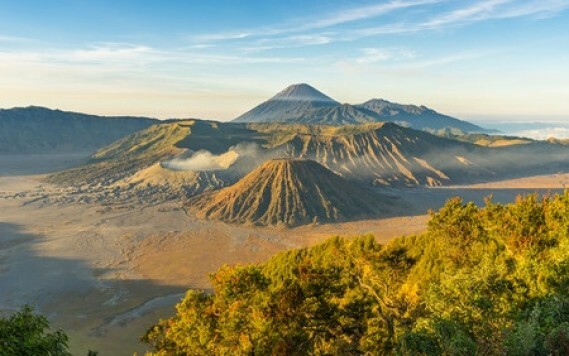 Apart from its famous crater lake that keeps spewing off white smoke, the fact that Mount Bromo is surrounded by a sea of fine volcanic sand (“Laut Pasir”, literally means “Sea of sand”) along with the breathtaking, larger than life landscape has been attracting travelers from all over the world. 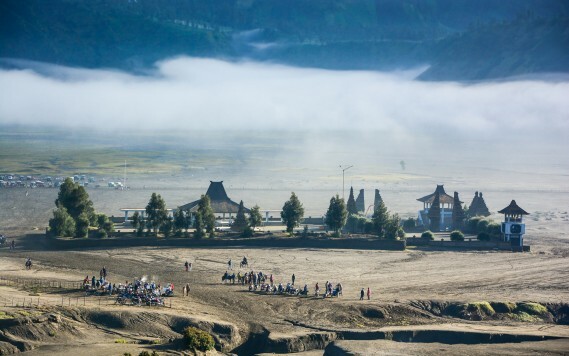 Myth has it that Mount Bromo is significant to the Tengger people who believe that the site is where their brave prince sacrificed his life for his family. To appease the Gods, the people will offer food and money by throwing it into the crater of the volcano once a year during annual Kasada (or Kasodo) festival. 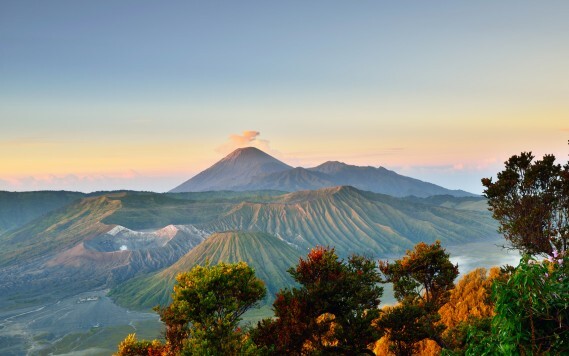 This national park is named after its two mountains, Mount Semeru (the highest in Java at 3,676m), Mount Bromo (the most popular) and the Tengger people who inhabit the area. 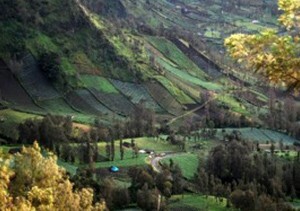 Due to its highly active nature, Mount Semeru is often closed, hiking Mount Semeru requires advanced planning and a permit from the national park authority. 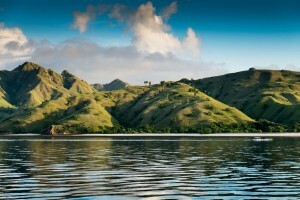 The Tenggerese people that inhabit in and around the park is one of the few significant Hindu communities left on the Java island. After the Muslim Madurese arrived in Java in the 19th century, native Hindu people of the region were outnumbered and ended up either converted to Islam or fled to the high mountain tops where they remain today. The temperatures are refreshingly cool during the day but gets chilly at night, often goes below 0°C and barely goes above 5°C. Whereas during the day it normally remains in the 10°C – 20°C range. 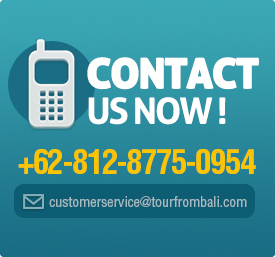 Our tour guide will pick you up at your hotel in Bali in the morning and explore the west coast of the island while traveling through the famous rice field, Rambut Siwi Temple and West Bali National Park. 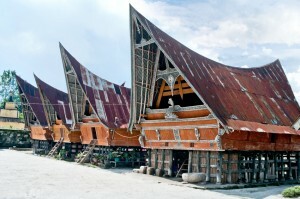 Once you land Ketapang Port, you're only a short walk away from the Banyuwangi Bus Terminal, where you will take the bus to Surabaya, a town that is only 1.5 to 2 hours away from Cemoro Lawang, where the Mt. Bromo is located. After getting to Surabaya, you'll be immediately transferred to Cemoro Lawang, where you will be checked into your hotel, we recommend an early night and preparing your breakfast the next day before you go to sleep today, as the next day will start at 3 A.M in the morning. Please note that the weather in Mt.Bromo can get a little chilly in the early morning, we strongly suggest you pack a light jacket with you for this journey. The day starts early with morning call at 03:00 AM. 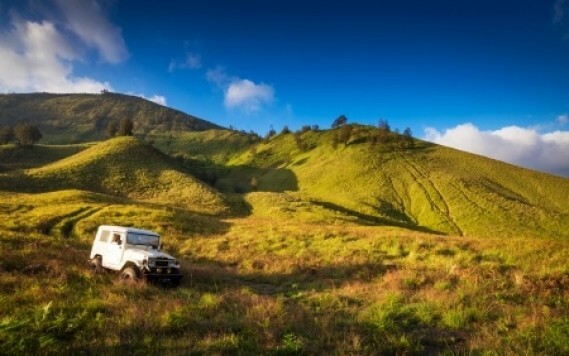 A four-wheel drive safari will take you all the way to the top of Mount Penanjakan, which stands at 2770 m and offers the best view of Bromo Crater and what is considered to be the most impressive sunrise in the world by travelers around the world. After the sunrise, the adventures continues. 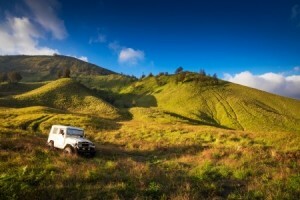 A drive through the "Sea of Sand" to reach the rim of the smoky Mount Bromo, where the breathtaking view will make the adventure one of the most memorable experience in your life. After checking the box of all the most-see spots and experience the area has to offer, you'll be enjoying the unique Indonesian cousin for lunch while you take a nice break from the adventure packed day. The journey back to Bali begins after lunch and the hotel check-out, you'll be scheduled to be back in Bali in the early evening. *The above itinerary and schedule may be changed according to weather and road conditions. *The package pricing includes all transportation within the tour, hotel stays (if applicable) and a tour guide, package does not include any dining/meal and relevant fees or entry fees to any tourist destination. 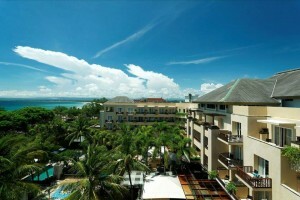 If dining arrangement is mentioned in itinerary, please keep in mind that the expenses are excluded in package prices. * All transportation arrangements are shared transportation, to arrange private transportation, please contact us for further assistance. *Our tour guide and drivers work hard to ensure you have a great experience, please be reminded that tips for them are not included in package price. *Prices in US Dollar and Reminbi are subject to change without notice as the exchange rates fluctuate. *The package includes all transportation within the tour, hotel stays (if applicable) and a tour guide, package does not include any dining/meal and relevant fees or entry fees to any tourist destination. * Pricing in US dollar and the RMB are subject to currency exchange rate fluctuation. Please contact us for private tour pricing. The itinerary and travel schedule stated in this page is for reference only, appropriate and reasonable adjustment may be made based on the actual traveling and/or weather condition. Please be mindful of local laws and regulations, as well as your personal safety. The pricing may vary based on the total number of people in the tour. You may request minor changes in destinations. In accordance with the provisions of the existing tourism operations, the Company reserves the right to adjust the size of the tour and may adjust the number of people in each tour on a case by case basis. Please be mindful of your valuables, avoid placing or leaving your valuables in your luggage or hotel room. 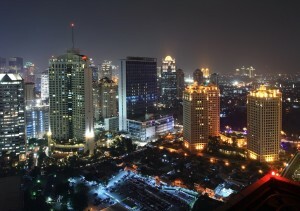 The Company and the traveling agency are not responsible for any personal belongings of the guest. Please get familiar with the emergency exist locations upon checking in a hotel, should any incident occur, please keep calm and use the emergency exits. Please use the lock buckle in your room for your safety, smoking is prohibited in the hotels. Please only use the hotel pool during the opening hour, the hotel and the traveling agency are not responsible for any incidents occur outside of opening hours. Please wear a life jacket when engaging in any water activities or on board of a ship, boat, canoe. Please ensure your personal health and conditions allow you to engage in water activities. People with pregnancy, heart disease, high blood pressure, along with seniors and small children; are not to engage in any water activities as well as other extreme sports activities. 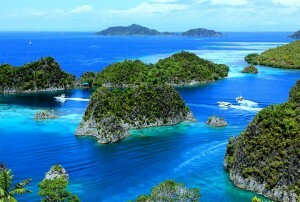 The traveling agency is not responsible for any incident during the activities involving personal health conditions. Please refrain yourself from all prohibited activities outside the tour such as taking photos of the wildlife, playing with wild animals. Please follow the trainer's instructions carefully to avoid incidents. In the unfortunate event of diarrhea, please inform the tour guide or group leader immediately and do not attempt to obtain any medication on your own. Local regulation, "Travel Law" stipulates the traveler cannot leave the tour. All unauthorized removal from the tour will face legal consequence. Please confirm your preference of bed size and number of people at the time of booking. The default class of all hotel rooms in the tour is the standard room. You may be refunded in the case of war, strikes, earthquakes and manpower shortage, etc. No refund will be issued for any breach in the agreement, airfare, cancellation of the tour due to personal reasons or visa problems. Hotel fees, car rentals and other expenses for the tour are non-refundable. 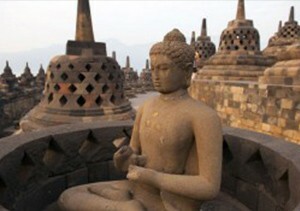 The package includes all transportation within the tour, hotel accommodation, and tour guide. All dining and relevant fees, and entry fees to any tourist destination are excluded and have to be paid at the time of entry and/or dining. 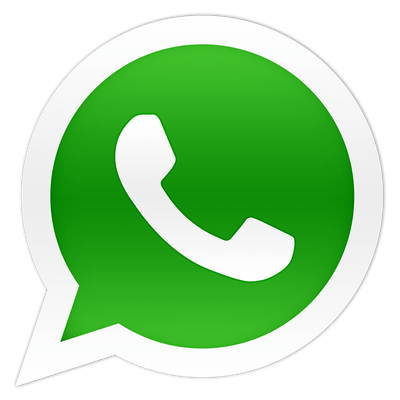 All transportation arrangements are shared transportation, for private transportation arrangement, please contact us for further assistance. (1) In accordance with the regulation, in case of changes in ticket prices for entries of destinations, the differences should be paid by the traveler. Please read our complete terms and conditions here.